Join us for the 48th Annual Holiday Bazaar Arts and Crafts Show! 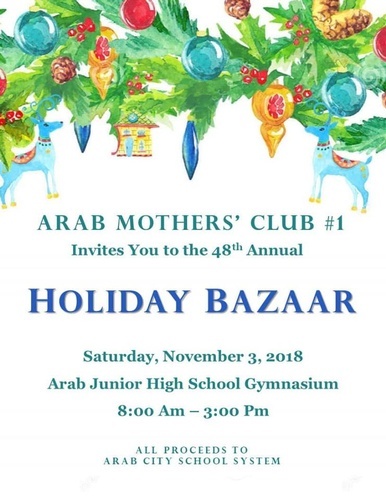 With over 85+ vendors, the Arab Mothers' Club #1 invites you to come spend the day with us at this annual event! Enter for your chance to win an Big Green Egg, a Yeti Cooler, and $200 cash prize! Concessions available with breakfast and lunch. Admission is $3 for adults and $1 for students.